Dorsey Wright & Associates, Inc. (DWA) is a globally-recognized provider of investment research and money management products. The Company’s core product and service offerings are web-based subscriptions that provide technical analysis and research on over 7,000 stocks, 14,000 mutual funds, 20,000 international equities, and more than 1,000 ETFs. DWA has established itself as the preeminent provider of comprehensive technical research services with broad portfolio and value-added analysis capabilities. Additionally, the Company offers its own money management products including mutual funds, ETFs, UITs, and separately managed accounts that utilize the investment tools and allocation model data from the Company’s core research analysis and services. With $1.8 billion of assets under management, DWA’s money management business has significantly outperformed its peers. 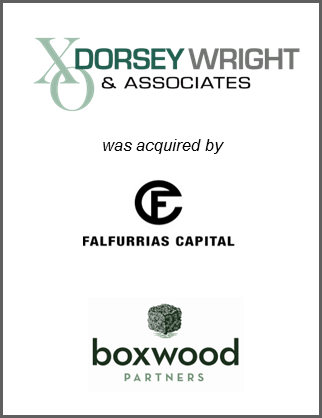 Boxwood Partners acted as the exclusive advisor to Dorsey Wright with respect to the transaction and made a co-investment alongside Falfurrias Capital Partners.